Threat to blow up Petronas Twin Towers: Real or Hoax? Kuala Lumpur Mayor Datuk Seri Ahmad Phesal Talib received a bomb threat letter, warning that if the RM20 million ransom was not met; a major “tourist destination” in the city would be destroyed. KUALA LUMPUR: Police have quizzed four bank account holders whose particulars appeared in a ransom demand letter sent to City Hall over a threat to blow up the Kuala Lumpur City Centre (KLCC) Twin Towers. The four men who showed up on Saturday for questioning by police said they are puzzled how their names and bank account details were obtained by the sender of the letter, who is believed to be a local. Based on initial investigations, police are almost certain that the four are not involved in the threat. It is learnt that the sum demanded was RM20 million and not RM10 million as reported initially. 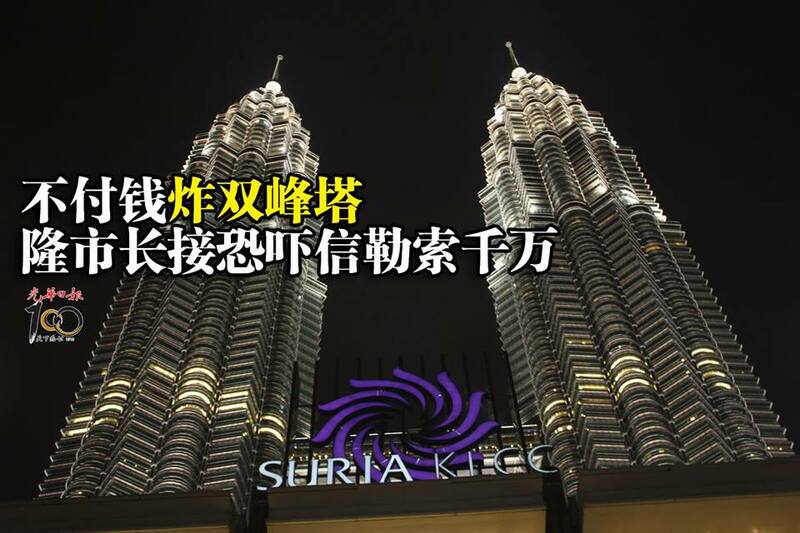 It is also learnt that police have advised the management of KLCC to beef up security and be watchful for suspicious movements. Officials of foreign embassies and consulates in the city have also raised their concerns with police after the case was highlighted in the media. Sources said police have investigated an address stated on the shipment slip of the letter that was sent by a courier company and it lead to a vacant shoplot in Kampung Pandan. KUALA LUMPUR, Jan 11 — Kuala Lumpur mayor Datuk Seri Ahmad Phesal Talib fears tourism in the city would be affected by a “bomb threat” city hall had received. “We at City Hall are not affected by the threat but I worry that tourism in the city would be tarnished because of such threats,” he said. Ahmad Phesal said the letter, which was received by his office last Thursday, was not addressed to him, but to City Hall. “I believe it was more an extortion instead of a threat. RM20 million was demanded to be deposited into four separate local bank accounts or the Twin Towers would be bombed. The mayor said he did not suspect someone working in City Hall to have sent the letter. Kuala Lumpur Mayor Datuk Seri Ahmad Phesal Talib received a bomb threat letter, warning that if the RM10 million ransom was not met; a major “tourist destination” in the city would be destroyed. Kuala Lumpur Mayor Datuk Seri Ahmad Phesal Talib will leave it to the police and the management of Kuala Lumpur City Centre (KLCC) to handle a bomb threat targeting the city’s iconic twin towers. “While the authorities must investigate every threat, giving in to threats only begets more threats, and the public must go about their daily lives. “KLCC is an iconic building and is frequented by tourists. Despite recent bombings and bomb threats in Paris and Sydney, we don’t want people to panic here,” he told The Rakyat Post. 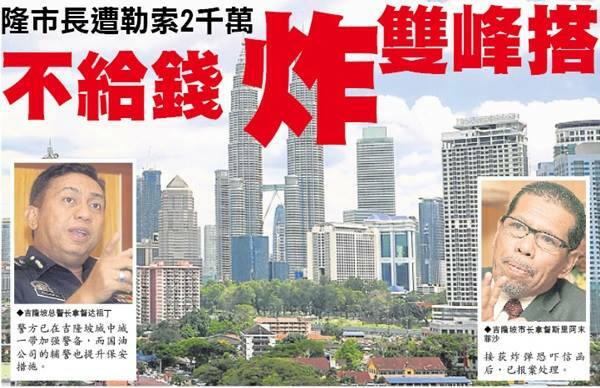 Ahmad Phesal was commenting when asked about a report in English daily New Straits Times that the mayor’s office had received a letter on Thursday threatening to bomb KLCC if RM10 million was not banked into four bank accounts. Quoting sources, the daily reported that the person who wrote the letter may hold a grudge against City Hall based on the vulgar language used. The daily also quoted deputy Inspector General of Police Datuk Seri Noor Rashid Ibrahim as saying that initial investigations showed that the threat may have come from a disturbed person. However, the police were taking it seriously and investigations were being carried out under Section 507 of the Penal Code for criminal intimidation by anonymous communication. This entry was posted in bomb threat, crime, KLCC, Kuala Lumpur, malaysia, malaysia malaysia crime KL crime, threat to blow up Petronas Twin Towers and tagged bomb threat to Petronas Twin Towers, KL, KL Mayor, KLCC, kuala lumpur, Petronas Twin Towers. Bookmark the permalink.